For those who are fans of folklore, monsters, or just a good yarn, this picture book is a real treat. 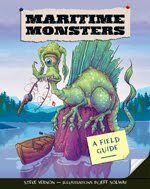 Steve Vernon’s wild tales about the monsters of the Maritime region are brought vividly to life by the talented illustrations of Jeff Soloway, creating a lively picture book that kids will love. With a colourful full-page illustration, imaginative story and loads of factoids for each of the fifteen monsters in the book, you’ll learn more than you even knew was possible about the mythical beasts of the maritimes. From location and diet to a detailed physical description and special advice for monster-hunting, Vernon covers it all. From ‘Old Hook Snout’ to ‘Sheila the Sea Hag’, this is a great little book. As a set of bedtime tales, entertainment for your little one’s next campfire soiree, or just for fun, you won’t be disappointed! This entry was posted in Kids, KinderScares, Picture Books and tagged Maritime Monsters, monsters, scary picture books, Steve Vernon by Shelagh. Bookmark the permalink.